Over time, water wells become clogged and lose efficiency which directly relates to drinking water quality and quantity. 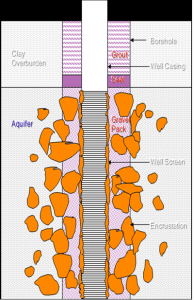 Naturally occurring minerals precipitate out of solution as they enter the gravel pack and well screen of water wells. These minerals accumulate on the openings of the well screen and open spaces in the gravel pack, reducing the yield of the well. 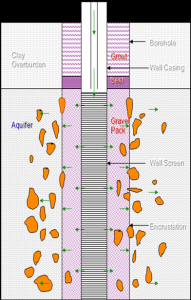 The precipitated minerals, along with oxygen introduced by the operation of the pump, cause an increase in biological activity, further reducing the yield of the well. The environment in a water well is oxygen- and mineral-rich, ideal for bacteria to thrive and plugging to occur. If not cleaned, the gravel pack and well screens get clogged. 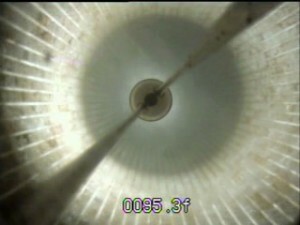 The more clogged they get, the more costly it can be to rehabilitate a well. Left unattended, there is always the possibility of a system failure. We won’t let that happen to you. Inspections are extremely important in the evaluation of your equipment. 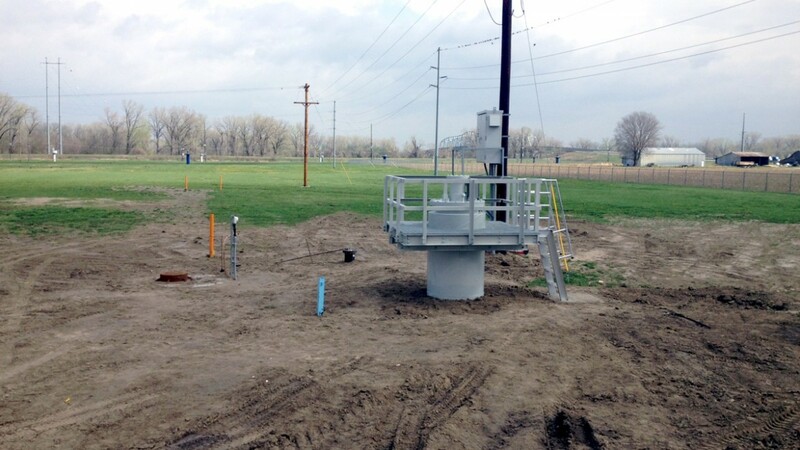 BWP’s experienced personnel will provide you with a detailed inspection of your well and pump. We provide you inspection documentation that ensure compliance. 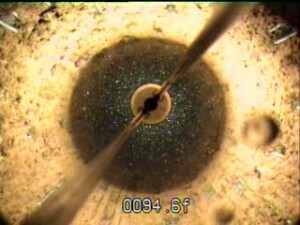 Should pump repairs be necessary, Brotcke Well & Pump provides a 100% guarantee. 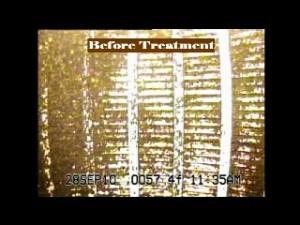 If the well needs cleaning, we have a patented process to not only clean your well, but also improve efficiency. The Brotcke High Velocity Injection Process (U.S. Patent Number 5392814) is designed to clean this material mechanically by injecting a custom blend of chemicals at rates of up to 4,200 GPM with pressures of 60 PSI. 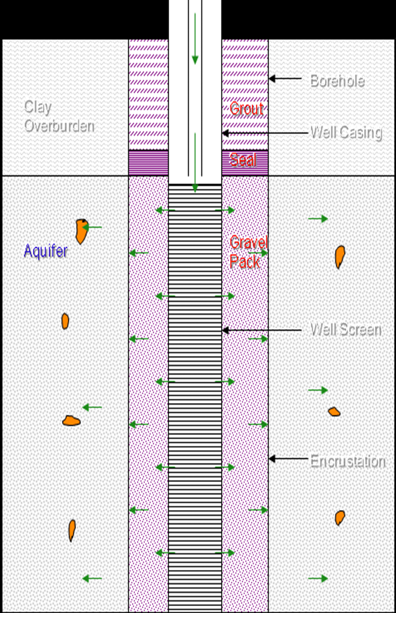 By reversing the flow of fluid into the well at an extremely high rate, the loosened mineral and biological build up is removed from the well screen, gravel pack and native formation. Adding a custom blend of chemicals to the process achieves more effective cleaning by dissolving the mineral buildup and sequestering these materials so they can be removed from the well. 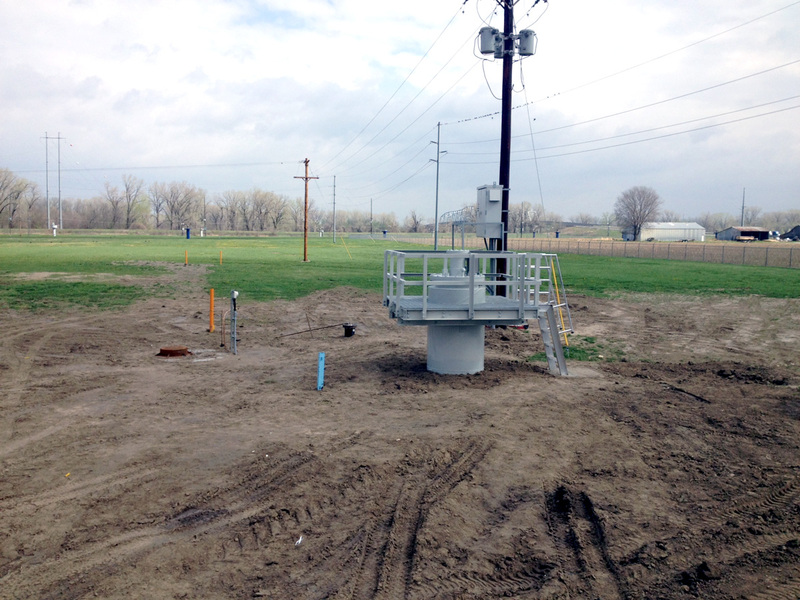 Our High Velocity Injection Technique has successfully rehabilitated hundreds of wells in the Midwest. 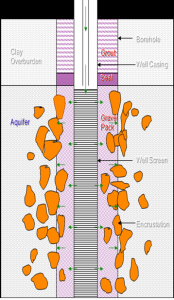 Through this process, mineral deposits are removed from the formation as well as the well screen resulting in capacities much higher than those achieved by traditional methods of well cleaning. 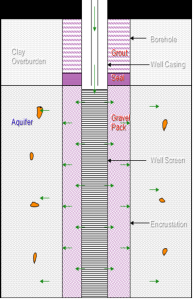 Brotcke Well & Pump, Inc. (BWP) uses a patented High Velocity Injection Treatment process. It is a unique technique designed by BWP. A custom blend of chemicals engineered to meet each well’s specific requirements is injected and surged into the well and forced out into the formation. All chemicals used by BWP are National Sanitary Foundation (NSF) approved. Click the movie above to see the difference. ©2017 Brotcke Well & Pump, Incorporated. All Rights Reserved.